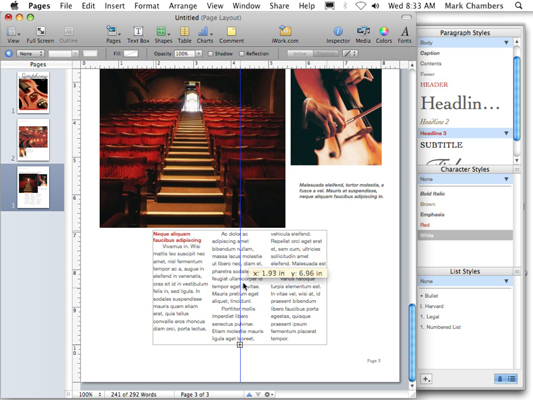 Mac OS X Snow Leopard offers the Pages application for desktop publishing. Although it can be used like a word-processing program, it has many additional features that make creating attractive documents that include text and graphics a breeze. Pages list: This thumbnail list displays all the pages you’ve created within your document. (For a single-page document, of course, the Page list contains only a single thumbnail.) You can switch instantly between different pages in your document by clicking the desired thumbnail in the list. 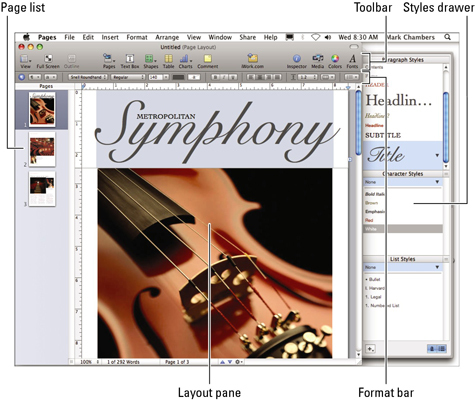 Layout pane: This section takes up most of the Pages window; it’s where you design and edit each page in your document. Toolbar: Yep, Pages has its own toolbar. The toolbar keeps all the most common application controls within easy, one-click reach. Styles Drawer: This window extension allows you to switch the appearance of selected paragraphs, characters, and lists. You can hide and display the Styles Drawer from the View menu or from the View drop-down menu on the toolbar. Format Bar: This button strip runs underneath the Pages toolbar, allowing you to format selected text, paragraphs, and lists on the fly. Use the Snow Leopard Pages window to layout text and graphics. You can also move a box, including all the stuff it contains, to another location within the Layout pane. Click in the center of the box and drag the box to the desired spot. Note that Pages displays blue alignment lines to help you align the box with other elements around it (or with regular divisions of the page, such as the vertical center of a poster or flyer). Move a text boxes within Pages’s Layout pane. To select text or graphics within a box, you must first click the box to select it and then click again on the line of text or the graphic that you want to change.